By Lawyers have been providing content to the legal industry since 2004 and is now Australia’s leading library of legal guides and precedents, offering practical and professional guidance for all major areas of law. The philosophy behind the legal guides is simple but revolutionary – to deliver information and guidance in a format that allows legal practitioners and support staff to run matters logically, from taking instructions through to finalising the matter. Each guide contains links to commentary and precedents, all laid out in a clear concise step-by-step approach for the conduct of each matter, from beginning to end. There are also ‘If required’ folders and ‘libraries of less common forms and precedents’ for those occasions where your matter does not follow the usual steps. This structure, which is a very useful risk management tool, not only allows support staff to confidently conduct matters in areas they are perhaps unfamiliar with, but also allows for precise answers to be found quickly. Users have the freedom to access as much, or as little, guidance as is needed, with the ability to easily navigate to the commentary and/or precedents required. This clear structure, combined with plain language practical content, kept up to date with legislative changes and the evolution of the common law, creates a one-stop resource essential to daily practice. The days of printing, compiling and posting, or delivering, numerous contracts to agents are gone. Email is the preferred method and rather than sending it in several emails or a group of documents all in different file formats, its best to create a single secure PDF of the listing contract. Once a buyer is found and the contract updated, a secure PDF of the contract of sale can be created and emailed to the purchaser’s solicitor. Creating the single secure PDF is made simple by the LEAP function create combined PDF. Select the Contract pages, searches and any other documents required. To select multiple documents at once, click the first document then hold Ctrl to select the other documents. Right-click the highlighted documents and select Create Combined PDF. In the Create PDF window, rename the contract eg. Contract for Smith to Brown. Reorder the contract by using the up and down arrows to position it in the list. The order of the documents in this list is the order that they will appear in the compiled contract. Tick the Combine, Secure and/or Bookmark check boxes as appropriate for the compiled contract. Click Create PDF and the PDF contract will appear in your Correspondence List. To email the contract from the matter select it in the correspondence list, and any other documents required – click the first document then hold Ctrl to select any others. Right-click the highlighted documents and select Email. If you have already created a new email from the matter and then wish to attach the contract on the Message tab of the email, select Attach File on the LEAP Email toolbar. You’ll be able to attach documents in either the original format or convert them to PDF. As the contract is already a single PDF it can be attached in original format. Ready to exchange? The By Lawyers contract anticipates exchange by email and sets out the agreed procedure in detail. Exchange is instantaneous. Each party has a complete PDF of the contract. A busy legal office sees many clients and takes many instructions throughout the working week. By Friday afternoon it is not easy to remember clearly the instructions taken at 9am Monday morning. That’s why it is so important to take clear concise instructions that can be used to run the matter or be passed on to a paralegal. ‘I have my trusty note pad’ many say, well not only is there the potential for notes to be piecemeal and perhaps mislaid, there is also no framework for the instructions, no reminders or tips about important information to collect or things to discuss. Retainer Instructions are drafted and reviewed by practising lawyers and conveyancers to ensure they are collecting the necessary instructions, up to date and user friendly. Every matter plan has a retainer instruction precedent that is unique to that matter type, covering the basics, such as the client’s details through to the important facts of the matter and including helpful tips such as tax implications, duties concessions and grants. The retainer instructions are designed to be printed ahead of the initial meeting and are used to record the notes and instructions taken during the meeting. They follow a logical progression and provide prompts ensuring nothing is missed. Retainer instructions are designed to cover everything! But if you know the client, ‘still at the same address?’ there’s no need to fill in all the contact details – just record their names. Cross out anything which is irrelevant. The important thing is that unlike a notepad a retainer instruction sheet clearly demonstrates the depth of the interview taken, and what was relevant and what wasn’t. The retainer instructions have all the latest information at your fingertips. Scale fees for estate matters. Order of succession on intestacy. Stamp duty amounts for first home buyers. And so much more. In addition to ensuring that good instructions are taken, retainer instructions assist support staff to open the file. All the information they need is there, set out clearly. After opening the matter, they can easily follow any additional instructions noted in the to do list at the back of the retainer instructions. Some practitioners might only use Retainer Instructions for unfamiliar or less commonly practised matter types. While they are very good for this purpose they are equally important in your most commonly practiced areas of law. Many people know conveyancing backwards, but being familiar can lead to becoming complacent with instruction taking, which can lead to follow up calls to check things with the client. Not terribly professional. The Will Retainer Instructions may be signed as an informal will if necessary for unwell clients or where there may be a significant time lapse between taking instructions and execution of the will. A full commentary is a practical discussion on an area of law which covers not only the theory of conducting such a matter but also the practical aspects too. By Lawyers commentaries are written by lawyers, barristers and conveyancers all with one thing in common – they are practicing professionals. This provides a level of practicality to the commentaries which truly assists practitioners in the conduct of a matter. Commentaries have largely been written to meet the needs of small to mid-size firms. All By Lawyers commentaries are updated in line with the most recent developments in legislation and case law. Practitioners using the commentary can be assured that any recent developments that affect their clients and area of practice are covered. A By Lawyers commentary is designed to help a practitioner navigate a matter by combining best practice advice with relevant information. Each commentary is structured to follow the progression of a typical matter, ensuring that practitioners start and stay on the right track. By Lawyers commentaries are also written with a strong practical focus which ensures that users are easily able to locate the information they need to get the job done. In a small law firm this is a valuable resource as it allows practitioners to delegate work to paralegals and other support staff with confidence. Some complex matters can call for additional in-depth analysis and research and By Lawyers commentaries offer the perfect starting point with detailed links to legislation and case law. In addition, By Lawyers also publishes articles and in-depth Manuals on popular areas of practice such as family law and property law ensuring that users can gain an in-depth understanding of unfamiliar areas of practice. The simplest way of inserting a new clause is to select and copy the clause above, along with its heading, and paste it below the existing clauses. This will bring with it the style applied to the clause, including the underline, and any associated numbering or bullets. Then simply change the heading and the content of the clause. If pasting content from an external source such as another word document or an internet page, select ‘paste special’ from the home ribbon or menu and then ‘unformatted text’. Should this process result in irregular formatting, then follow the procedure below. Create the new heading. Then on a separate line create the body text of the clause. Using format painter (Ctrl + Shift + C to copy and Ctrl + Shift + v to paste) apply the formatting from an existing clause within the document. Starting with the heading first, select an existing heading and copy the formatting (Ctrl + Shift + C). Now select the new heading and apply the formatting (Ctrl + Shift + v). Repeat these steps for the body text of the clause. Removing unwanted lines above or below a paragraph. If you find that there are unwanted lines appearing above or below a paragraph, place the cursor above or below the affected lines and use the borders button on the Home ribbon to unselect any applied borders by clicking on them once. You may have to repeat this step more than once depending on the number of border lines appearing. The table of contents uses the formatting attached to the headings to populate the table. Following the above procedures when amending a document will ensure that the table of contents will continue to work and correctly reflect any amendments. Once you have inserted or removed paragraphs with headings, go to the table of contents, right click the first heading and select ‘update field’ then ‘update entire table’. Alternatively, you can use the keyboard shortcut Ctrl + A then F9. The execution clauses within the deeds and agreements populate from the party details entered on the cards for the matter. If the need to manually enter party details arises, there are blank execution clauses in the folder named ‘Formatting fixes, blank deeds, agreements & execution clauses’ which appears on every guide. Simply select and delete the existing execution clause, and replace it with the appropriate blank execution clause and complete the details manually. Click the ‘Guides & Precedents’ button at the top of the Matter. If you cannot find the precedent you need, click the ‘Search’ tab and type in the precedent name in the top left hand corner of the screen and click the Search button. You can create new Precedents or modify the ones already in LEAP. Need help modifying a precedent? LEAP Certified Consultants specialise in making advanced changes to precedents. Click here to find a consultant. Note : All precedents are based on Document Types. If you wish to modify any information on a precedent such as an address, letterhead, signature refer to the section on “Document Types”. Open the matter type you wish to create the precedent in e.g. Letter to Vendor Regarding Signing of Contract, open a Sale matter. Click on the ‘Guides & Precedents’ button at the top of the matter. Right click anywhere on the screen and click New > Word or Excel Precedent. Note: You can also create precedents in the folders available by double clicking on the folder and then right clicking and selecting New > Word or Excel Precedent. Select the template you wish to use and then select the recipient of the template. Click ‘OK’. Enter the contents of your precedent where the body bookmark is placed, i.e Below the “RE” line and above “Yours Faithfully”. Fields can be inserted into your precedent to make it automated. Select the editing button, then click insert. A list of fields will appear on the right hand side of the screen. Note: The only place you can enter text is where the Body bookmark is located. Any other text will be overridden by the document template. For more information on locating the Body Bookmark, refer to the section above. Make sure your cursor is in the correct location on the precedent. Select the appropriate section where the field is located. For example, If you need the completion date, select ‘Matter’. Select the appropriate field from the list E.g. ‘Completion/Settlement Date’. Click ‘insert’ at the bottom right hand corner of the screen. Note: The field you are looking for may also be a hidden field. Click the ‘Show hidden fields’ box and the bottom of the screen to view them. Continue inserting fields in the appropriate locations on your precedent. Note: To view the field name, right click on the field that has been inserted into the document and select “Toggle field codes”. Once you have completed your precedent. Click ‘Save & Close’ in the top left hand corner of word. Rename your precedent and click ok. The precedent will now be available in all matters of the same matter type. 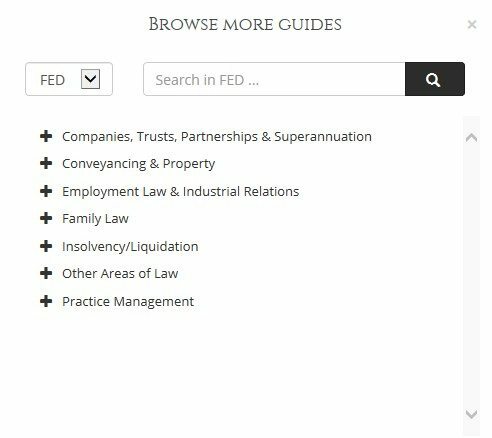 Click once on the ‘Guides and Precedents’ button at the top of your matter. Locate the precedent you wish to amend. Right click on the precedent you wish to modify and then select ‘Modify Precedent’. Your precedent will open in Microsoft Word allowing you to make any necessary amendments within the letter. You can also import precedents into LEAP that are saved on your computer. Make sure you open a matter that corresponds with the matter type that the precedent is for, then click the ‘Guides & Precedents’ button at the top of the matter. Simply right click on the screen and select ‘Import Precedent’. You will be presented with a navigation screen. Navigate to where your precedent is saved on your computer and double click the precedent. This will import it to the location that you have opened in LEAP. You can then modify the precedent to add in fields. There are two ways to move a precedent. Either right click on the precedent to cut and paste or follow the drag and drop method described below. Drag and drop the precedent into the correct folder. Precedent folders can also be dragged and dropped into other precedent folders. If a precedent has been moved and needs to be returned to it original location, right click on the precedent and select ‘Reset Precedent’s Location to Original’. A shortcut creates a link to an original precedent. Shortcuts are useful when the same precedent is required in two different locations. Using a shortcut instead of duplicating a precedent means that only one precedent needs to be updated and maintained. The shortcut to the precedent will appear. A shortcut can be identified as it contains the icon. If required, the shortcut can then be moved to a new location. Shortcuts can also be created from a precedent folder. Removing a precedent from the original folder will also remove the precedent from the shortcut folder and vise versa. To locate the original precedent or precedent folder from a shortcut, right click on the shortcut and select ‘Find Target Precedent/Folder’. Duplicating creates an exact copy of the precedent, but does not contain a link back to the original document. This is useful when you want to create a new precedent based on an existing document. Once a precedent is duplicated, any changes to the original document will not flow through to the duplicated version. There are two ways to duplicate a precedent. Either right click on the precedent to copy and paste, or follow the method described below. Another version of the precedent will appear and if required, can be moved to a new location. Folders can be added to the ‘Guides & Precedents’ window. This allows users to customise the Guides & Precedents interface. It also allows user Precedents to be separated from LEAP Precedents. Open the type of matter which you would like to add a folder. Open the type of matter which contains the folder. To hide deleted folders, click on ‘Tools’ and deselect ‘View Deleted Precedents’. The history of a precedent is recorded to allow you to monitor what version of the precedent you are using and to revert back to a previous version if required. Follow the instructions at the top of the page under “Accessing Precedents” to locate the document. From this window, you will be able to see how many changes have been made to the precedent and when they were made. You can also use the buttons at the top to preview a certain version of the document, compare two versions or set a particular version as the current one. This article demonstrates how to add a Christmas message to your correspondence. You will be presented with a list of document types. Right click on ‘Letter’ and then click ‘Edit’. This will open the document in edit mode where you are able to insert your Christmas Message. Once you have added your Christmas Message to the document, click the LEAP ‘Save & Close’ button in Microsoft Office Word. Continue on editing any other document types you wish to use. E.g. Fax, File Note etc. These changes will go through to all precedents that use these document types. Click the ‘More’ button at the top of the matter. You will be presented with a list of document types. Right click on ‘Letter’ and then click ‘History of Changes’. This will open the History of changes window. In the History of changes window, select the document that was being used before the Christmas Message was added and hit ‘Set as Current’. The ‘External Precedents Folder’ functionality allows your firm to maintain and keep your precedents locally on your machine or a networked location outside of LEAP. The selected folder will appear in the ‘Guides & Precedents’ window under the ‘External Precedents Folder’ tab. This eliminates the need to manually import your precedents into LEAP every time. Open ‘Guides & Precedents’ in a Matter. Select the ‘External Precedents Folder’ tab. Select the folder you want to display your local or networked precedents from. All folders and documents from within the selected folder will appear in the ‘Guides & Precedents’ window under the folder tree structure on the ‘External Precedents Folder’ tab. If documents are added to the file structure, the ‘External Precedents Folder’ can be refreshed via the right-click menus ‘Refresh List’ option. You can also open the target location of any file via the right-click menus ‘Show in File Explorer’ option. An external folder can be deselected by choosing ‘Deselect Current Folder’ from the options menu. 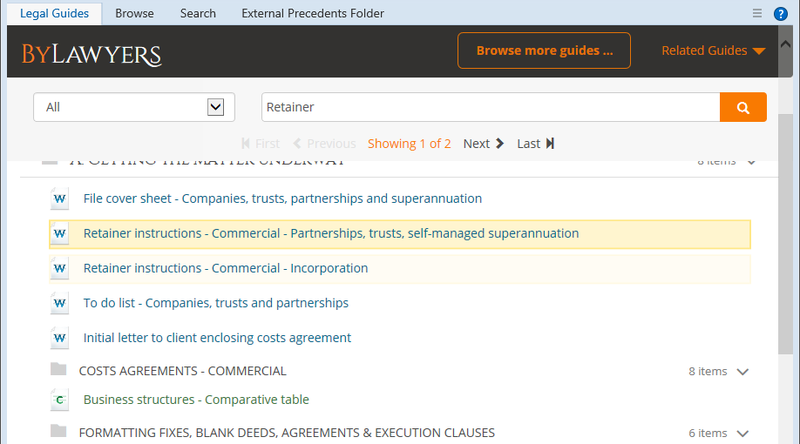 Custom precedents can be viewed from a single tab in the ‘Guides & Precedents’ window. This can be enabled by selecting ‘Show Custom Precedents Tab’ from the options menu. The ‘Custom Precedents’ tab will appear after the Search tab, listing every custom precedent created by the firm. Have the precedent open in Word. Rename your precedent and click “OK”. When generating a document in LEAP, all of your client information is merged onto that document using ‘Field Codes’. The advantage of this is that when you make a change to your matter in LEAP, those changes will carry over to the document, either when it is re-generated or when you click the ‘Update’ button at the top of Microsoft Word. If you want to make a change to a particular document without that field being updated when a change takes place, you can convert that field to text and enter the desired information directly into the document. Highlight the field you want to convert to text. If you are unsure if the highlighted text is a field, press Alt + F9 to view the field code. Once the field is highlighted, select ‘Convert Fields to Text’ from the ‘Advanced Functions’ toolbar. The converted field will no longer update when information is changed in LEAP for this document only. If you create a new document, it will still pull the relevant information from the Matter. You can add custom ‘Ask’, ‘Fillin’ and ‘If Then Else’ fields into your documents that will appear when you open it. Note: As customisation of fields can become quite complex, the guide below is for simple fields only. If you require advanced customisation of your documents, please refer to a LEAP Certified Consultant. An ‘Ask’ field will ask one question upon opening the document that can be filled into multiple locations. For example, if you want your name to appear at three different points on the document, it will ask ‘What is your name’ upon opening and the answer will be filled into all three locations. Click ‘Editing’ on the LEAP toolbar, then ‘Insert’. Click on th ‘Ask’ tab. In the ‘Bookmark’ field, type the name of the bookmark, this is for your reference only. Type the question into the ‘Prompt’ field and then the ‘Default Answer’ underneath. Click above the section that you want to insert your answer, then click ‘Insert’ to place it into the document. An example dialogue box will open to show you how this will look. NOTE: You will not see anything appear in the document at this point, but it MUST be above the section where you want your answers to go. Go to the ‘Ask Result’ tab and click where you want your answers displayed on the document. Click ‘Insert’ to place the answer. The ‘Default Answer’ will be displayed as a placeholder. A ‘Fillin Field’ works similarly to an ‘Ask’ field but is only useful when the answer is to be displayed at one point in the document. Click on the ‘Fillin’ tab. Fill out the ‘Prompt’ and ‘Default Answer’ field, then click ‘Insert’ to place the answer into the document. An ‘If Then Else’ statement will display information on a conditional basis. You can choose to make the ‘Field’, ‘Fillin’ or ‘Ask’ field the comparable field. We’ll use ‘Field’ for this example. Next, choose the field by clicking ‘Select’. Fill out ‘Step 2’ with the comparison. You can choose a different comparison type by clicking on the drop down menu. Click ‘Insert’ when completed to put it into the document. In this example, if the matter field ‘Person Responsible Initials’ is equal to ‘MH’, it will display ‘True. If it is anything else, it will display ‘False’.